On March 19, we celebrated the Feast of St. Joseph, the foster father of Jesus and spouse to the Blessed Virgin Mary. I have had a devotion to this great man of God ever since my childhood and even chose the name Joseph as my Confirmation name. However, the impact of St. Joseph on my life was present even before I was conceived. My mother, Marie Ice, was told by doctors she couldn’t have any more children after the birth of my three older brothers. When she shared this news with the Benedictine Sisters of Mount St. Scholastica, they prayed a novena to St. Joseph on her behalf. Soon thereafter, I was born. Fast forward to my adult years and though my career path has taken me to many cities, I am humbled to be the CEO of Catholic Charities of Kansas City-St. Joseph, only the second diocese in the world to be named after St. Joseph (the first being San Jose, Costa Rica in 1850). St. Joseph also serves as a perfect role model for our work at Catholic Charities. He was a helper to Mary throughout her pregnancy, an adoptive father, a protector of women and children, a man who respected the dignity of human life, understood the value of work, sought safe shelter for his family, and likely lived a life of poverty (Luke 2:22-24). 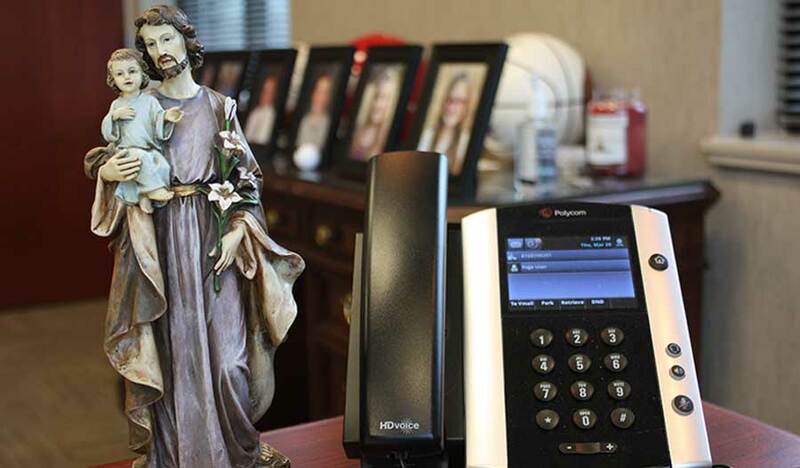 Therefore, I keep a statue of St. Joseph holding the baby Jesus next to my office telephone. When people inquire about it, I proudly claim him as my hero and father in the faith. St. Joseph, please pray for Catholic Charities and for all those in the diocese bearing your name.